This page is about the American medium tank M4A5. For other uses of the designation, see M4 (Disambiguation). The M4A5 Ram II is a premium Rank II American medium tank with a battle rating of 3.7 (AB/RB/SB). 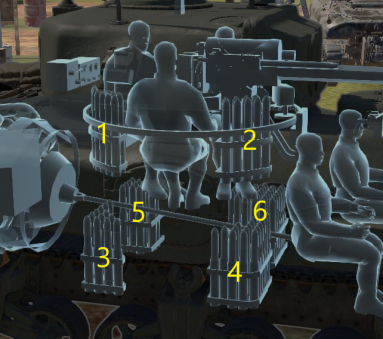 It was introduced in Update 1.61 "Road to Glory". 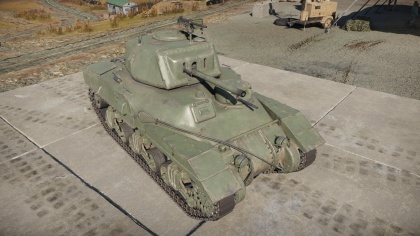 The first Canadian tank added into War Thunder, the Ram II was an attempt by the Canadians to produce their own turreted tank with the M3 Medium chassis. The Ram can be called a "hybrid" between the M3 medium tanks and the M4 Sherman. The M4A5 is quite a hybrid of a variety of traits among the British and American ground forces tree. The Ram is made up of the transmission, suspension, and engine from the American M3 Lee, the turreted platform of an M4 Sherman, and the 6-pounder gun from the British. Thus, in its place in Rank 2, the play style is akin to the M3 Lee's mobility with the power of a turreted tank. It should then be played like like any standard American medium tank, with extra caution on the weak points presented on the front armour right next to the front machine gun turret. 8 mm RHA plate separating the engine and crew compartment. Ammo racks of the M4A5 Ram II. Strong frontal armour, especially the upper glacis, 100+ mm of effective thickness. Well armoured at the rank. Lots of camouflages to unlock. 63.5 mm of side armour, works well when angled. 57 mm gun that can handle every foe it encounters. Has .30 cal anti-aircraft defence. One of the few tanks that has all it's machine guns modeled and working properly. Relatively cheap in GE price. Relatively easy to play in matches. Extremely good at taking hits and creating distractions. Very hard for contemporary enemy tanks to knock it out in one hit. This tank will feel like home for M4A3E2 Jumbo players because of its similar play style. Driver hatch is a prominent weak point on front armour. Armour protecting the transmission is only 50.8 mm thick. Gun mantlet has average thickness. 57 mm gun lacks explosive filler. Very cramped turret, a single shot will likely disable all 3 crew members. Most ammo racks are located below the turret and underneath the upper hull where it's only protected by 38.1 mm unangled armour. Unlike the usual Shermans with top-mounted .50 cal, this only has 0.30 cal. The aftermath of the Battle of France left the British military decimated as most of their equipments had to be left behind in their withdrawal at Dunkirk. Desperate for military equipment, especially tanks, they requested from the U.S. to help produce the necessary vehicles to supplement the armoured forces. Another firm assisting the British in armoured productions was Canada via the Canadian Pacific Railway’s Angus Shops with a contract to build 300 Valentine tanks. Later, Canada themselves ordered 488 Valentines to build up their own tank forces, but realize that they need a cruiser tank to attack and exploit breakthroughs. Complications between adapting British designs to North American standards and difference in material quality cause the Canadians to seek an American-derived cruiser tank rather than a British design. Throughout the Ram’s designing and testings, the Canadians ran into problems of inexperience around building a tank and lacking the necessary production lines to begin producing tank parts. Deriving the Ram off the M3 Medium required parts like the transmission and engine that were currently being produced in America, which were always in low numbers given American tank production at the time. America assisted in the production of the Ram by producing the pilot models and the Canadian Tank Arsenal was to be built by Montreal Locomotive Works, themselves a subsidiary of the American Locomotive Company who had experience building M3 tanks for the Americans. The first prototype was produced in June 1941 and featured a full 360 traversable turret with a cast steel body, featuring the same powertrain and engine as the M3 it was derived from. The Ram was also adapted for British specifications with adaption to a right-hand drive and weaponry. Overall the Ram was also shorter than the M3. It also featured the side doors and an machine gun turret on the front, but these were later removed in later productions. Production for the Ram started in November. Though intended to be fitted with the 6-pounder, the first 50 Rams produced used a 2-pounder due to lack of guns or mounts available for the Canadians. These were labeled Ram Mk.I. By February 1942, the Ram design switched back to the 6-pounder, which was designated the Ram Mk.II, which production continued until July 1943. During that time span, about 2,032 Rams and its variants were produced. Unfortunately, around the time the Ram became battle-worthy for the front-lines, the Americans started their mass-production of the M4 Shermans. The M4 Sherman was by all mean similar in automotive performances, but benefited by the mass-production of the American industry. The Sherman quickly made the Ram, which only saving grace was giving the M3 Medium a turret, unnecessary. In March 1942, the Canadian government made the decision to switch all production lines to produce the M4A1, with the Ram production only continuing until the proper machinery was ready, which then the Ram design remained idle. The Ram never saw combat usage and was only used as a training vehicle in Britain until mid-1944. 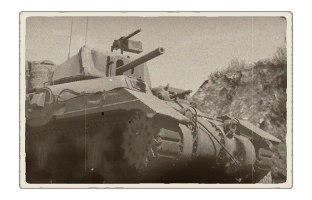 The Ram never saw combat as a tank, but its variants had a better record. Many Ram tanks were converted into armoured personnel carriers known as the Kangaroo, flamethrower vehicles known as the Badger, artillery observation vehicles, ammunition carriers, armoured recovery vehicles, and anti-tank gun tractor. Its most combat-oriented variant was the Sexton self-propelled gun with the 25-pounder howitzer developed to support the infantry, though the Sexton was also produced by the chassis from the Grizzly design. After World War II, the Netherlands were free to take possession of any Ram tanks in army dumps on their territory. The Dutch used these tanks to equip their first tank units, the 1st and 2nd Tank Battalions. The Rams were in poor state from low maintenance and disuse so they received additional Rams from Britain in slightly better conditions in 1947. By 1950, most of the Rams were broken down and only 50 were available for use between the two battalions. They were all replaced, along with Shermans in their inventory, by the Centurion tank in 1952, supplied by the Americans. The Rams only usage past that was as static pill boxes on the IJssel line facing the Soviets in the Cold War. The Ram unfortunately went down in history as one of Canada’s war design failures, with the M4 Sherman being produced in parallel by the U.S. overtaking it. It is also a testament to the disparity in the industrial base between the two countries. The Ram could still be attributed to kick starting Canadian production lines to be able to produce the M4A1 Shermans, which were designated the Grizzly. About 6 Ram tanks still survive today, with only 3 being the original tank design.